Difference between "SENS_TFMINI_CFG" & "SENS_EN_TFMINI"
I wanted to know if the "SENS_TFMINI_CFG" & "SENS_EN_TFMINI" are actually the same parameters. 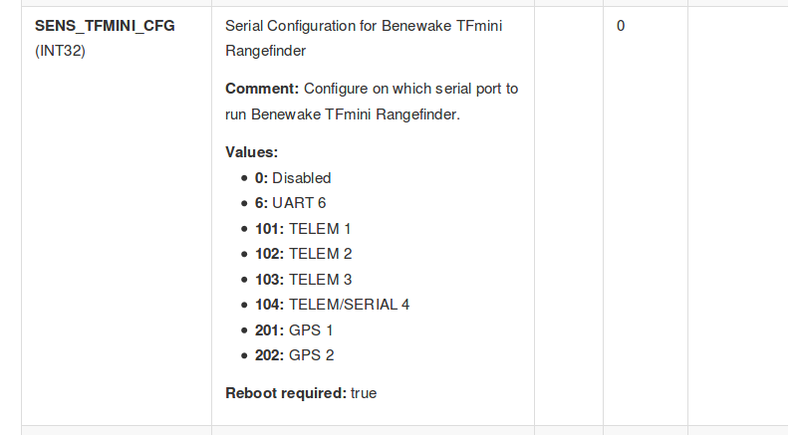 I am getting the "SENS_EN_TFMINI" parameter in my parameter list (Firmware: v1.8.1 Stable Release, px4fmu-v2_lpe ). In the PX4 docs, the other parameter is mentioned. hi guy! SENS_EN_TFMINI is set 1 ,then start tfmini app to run. And the SENS_TFMINI_CFG is configure for hardware ,you can choose a uart port of pixhawk.